I was born in Eau Claire, Wisconsin but have spent most of my life in North Mankato, Minnesota. Both these are upper Midwest river towns. Eau Claire is an old logging town, while Mankato/North Mankato are old pioneer centers in agricultural country. I've had an interest and talent in visual art for a long time. I was not so much interested in art at a young age as good at it, and that natural ability turned into interest later. I went to college at Gustavus Adolphus College in Minnesota, majoring in Studio Art. I received my MFA in painting from the Savannah College of Art and Design in 2008. I get this question a lot. People often think landscape painting is a bit old fashioned. Maybe that's true, but maybe that's what is so good about it. When people ask me why I paint landscapes, I often freeze up because it is such a big question. What I want to say to them is, why not? We are born on landscape, live off of and in the landscape and when we die, we become an actual part of the landscape. No subject could be more relevant and deeply resonant with people. In a way, landscape is even more personal to the human experience than portraits and figure paintings. In fact, that brings up another reason for landscape. People get too into themselves and the minutia of their lives in a complex, modern society. Looking at landscapes encourages people to be freed from themselves for a moment. In our age, we have a culture which is causing us to feel separate from nature and the land, as though our fortunes are not tied. In reality, we can't escape nature and our reliance on the land. Landscape painting is the best way for me to get people to think about landscape, and nature and their relationship with it. Odd as it may seem, people sometimes need that separation of an art form to spark their attention. Someone might drive home from work through a beautiful area, but might be numb and feel a distance between themselves and nature. But to see nature depicted in a different context from literal realitymost powerfully in the form of a paintingthat sparks an awareness that translates to curiosity and the real world. What landscapes attract your attention? Places that are around me. I mostly paint local scenery, and always places I've been to. Water is very important to me and has been from a very young age, particularly flowing water. I paint a lot of rivers. The shapes and geography of riverbeds are fastening and beautiful. It is fun being a landscape painter in South-Central Minnesota, because there are hidden treasures. At quick glance it isn't showy land, and it can appear to simply be flat farm fields. But with investigation there are many beautiful areas to be found, mostly associated with rivers and lakes. One of the more unexpected hidden treasures in my area is waterfalls. I've done many paintings showcasing local waterfalls. What is the Stream Series? 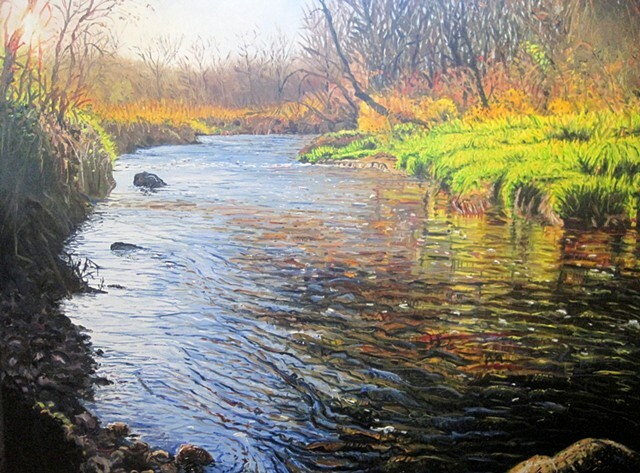 It's a series I started in 2011, which is small works that depict close-up views of streams and rivers. My normal landscapes are oils, but these are acrylic paintings. The use of acrylic paint allows me to glaze in endless layers and use a very high gloss. I have a very literal idea I use in these worksif there is water depicted it is always covered in a high gloss, and if there are things, such as rocks, above the water depicted, they are left matte. So the surface texture literally has a connection to water and land. What is the Roy Orbison Series? This series is a little glimpse into some of the more contemporary painting I do. The analogy I use is music. I listen to classical music and rock 'n' roll a lot. Classical music is like my landscapes and rock is like my Orbison stuff. My Orbisons are urban, cultural work that is about human experience in modern society. Specifically, the Orbison series is a lab for painting ideas. The purpose is to give me a matrix for painting ideas, like coral reefs need a matrix such as rock to start growing on in order to flourish. Conceptually, Roy Orbison and his music offers a subject matter for the series. To help this process, I've added a ruleI can only use red, black and white as pigments. This unifies the work, and the limitation actually increases creativity in many ways. Sometimes having too many options can stilt ideas. This series is not fan art. While I enjoy Roy's music he is not my favorite and the purpose of this work isn't simply to promote something I like. It is an exploration that often gets weird. The reason I chose Roy is because I like him and know about him, but not too much. He is very weird and unique in looks, persona and music. He is a pop culture icon, so many people are aware of him on some level, but he's not a cornerstone icon like Elvis. Using an artist who's medium is song as a subject, I have many options for using text in the paintings. All these factors make him ideal for this type of work. By staring at a small spot of culture that interests me, I am able to make work that arrests with a strange narrative and represents much more than the obvious subject at hand, Roy Kelton Orbison. It's an ongoing experiment. I would like to say a little about my landscape painting style, at the risk of being immodest. I feel that my style of painting landscape is unique. This is a subtle thing, so it is often overlooked or not recognized. I've gone to extremes of painting a whole work in one layer, from one corner to the other, with no under painting whatsoever, all the way to painting a work with countless layers of small marks and everything in between to get the right look for a painting. But technique aside, my work falls between what most landscape paintings are doing. It is realistic and specific to a moment and place, yet personal and expressive. I feel the utmost realism can only come out of work that goes beyond the literal, visual cues and uses style, color, and brushwork to convey a sense of experience. So my work is painted in a way most people have not quite seen. It doesn't fit into traditional realism, nor more edgy, graphic contemporary aesthetic. It cuts its own course like a wild river, as it sees fit.